David Newman is a marketing expert and founder of Do It! Marketing, a marketing strategy and “done-for-you” services firm dedicated to making thought-leading professionals successful. Free resources including David’s 97-page Strategic Marketing eBook are available online at www.doitmarketing.com. David is also the founder and editor of www.SpeakerCEO.com, the premiere online community for experts who want to speak more profitably. 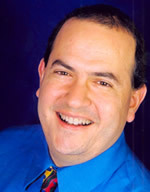 David has worked with over 300 speakers ranging from the brand-new speaker just starting out all the way up to 25-year speaking veterans and half a dozen members of the National Speakers Association CPAE Speaker Hall of Fame. After working with David and his team, speakers at every level generate MORE leads, BETTER prospects, and BIGGER sales.